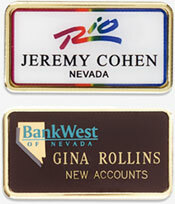 Name badges establish a professional image for your company. They make customers feel more comfortable and employees know they're part of a team. Name Badges help promote pride, productivity, and profit. Most likely, a lot of time and effort went into the creation of your company’s logo. There even may be rules and regulations surrounding its reproduction. Badges may be small in size, but they play a big role in your company’s presentation to the outside world. They often are the only form of introduction for your staff members to your most important audience - your customers. Visually, badges may be seen more than any other form of advertising. Financially, they are your most cost-effective form of advertising - when they’re done right. We at Recognition USA pride ourselves in personal service and quality products. We guarantee it. Executive Badges from Recognition USA features our proprietary doming process which ads luster, while extending the life of your badge. Say it with pure elegance by placing your name badge within an Executive frame with rounded corners. Frames are available in gold, silver or black. Approximately 3” wide x 1 1/2” high. Recognition USA is delighted to be a badge manufacturer and developer of custom badges. Your custom name badge program will be our top priority. Your customer service program will be developed with your badge sales representative. We look forward to working with you and providing the name badge program that will enhance your customer relationships!